The PTRS-41 or Simonov anti-tank rifle (Russian: ПротивоТанковое Ружьё Симонова) is the semi-automatic analog of the PTRD-41 anti-tank rifle. The PTRS-41 was produced and used by the Soviet Union during World War II. In the years between the World Wars, the Soviet Union began experimenting with different types of armour-piercing anti-tank cartridges. Finding the 12.7×108mm insufficient, they began development of what became the 14.5×114mm armour-piercing round. Rukavishnikov developed an antitank rifle (ru:Противотанковое ружьё Рукавишникова) designated M1939 to accommodate this cartridge, but it didn't have large success because of some manufacturing issues, a sufficient number of more effective anti-tank guns in the Red Army, and high expectations about new German tank armour. In 1941, the loss of huge amounts of anti-tank artillery created a need for a stop-gap anti-tank weapon, so famous USSR weapons designers such as Vasily A. Degtyaryov and Sergei G. Simonov designed two anti-tank rifles. Both were considered simpler and more suitable to wartime production than an updated Rukavishnikov rifle. Simonov used elements of his 1938 design, a 7.62 mm automatic rifle. The five-round magazine was loaded into the receiver and held under pressure by a swing magazine underneath. On firing the last round, the bolt is held open, and the magazine release catch can be operated only when the bolt is locked back. The gas-operated PTRS has a tendency to jam when dirty, and the 14.5 mm cartridge produces significant residue, blocking the gas port. The 14.5 mm armour-piercing bullet has a muzzle velocity of 1013 m/s and devastating ballistics. It can penetrate an armour plate up to 40 mm thick at a distance of 100 meters. In 1943 Simonov used a scaled-down PTRS-41 design for the SKS-45, that would accommodate the new 1943 designed M/43 7.62×39mm cartridge. PTRS-41 during World War II. Designed in 1938 by Sergei Gavrilovich Simonov, the PTRS-41 is a semi-automatic anti-tank rifle that was used along the Eastern Front in World War II and then used again in the Korean War and Chinese Civil War by various factions. Along with his partner Vasily Degtyaryov, Simonov helped the Soviet Union develop new weapons between World Wars. During this time, Degtyaryov went on to create the PTRD-41 while Simonov created and designed its cousin rifle, the PTRS-41. As one of Simonov's creations, the PTRS-41 was sometimes known as simply the "Simonov" on the battlefield. Although more advanced, the PTRS was harder to use and less reliable than the cheaper PTRD while yielding similar performance, so the PTRD was used more. Guns captured by the Germans were given the designation 14.5 mm PaB 784(r). PTRS-41 rifles are still in use by Donbass militiamen in Ukraine, during the Donbass War, due to their ability to penetrate APC armor. The ammunition used is actual World War II vintage. One of the rifles was fitted with a nonorganic muzzle brake from a PTRD. ^ a b c "Modern Firearms, Simonov PTRS". Retrieved 18 February 2012. ^ Chamberlain, Peter (1974). Anti-tank weapons. Gander, Terry. New York: Arco Pub. Co. p. 57. ISBN 0668036079. OCLC 1299755. ^ Jenzen-Jones, N.R. ; Ferguson, Jonathan (2014). Raising Red Flags: An Examination of Arms & Munitions in the Ongoing Conflict in Ukraine. Armament Research Services Pty. Ltd. p. 43. ISBN 9780992462437. 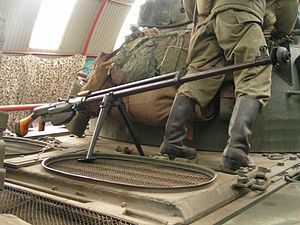 Wikimedia Commons has media related to PTRS-41. Koll, Christian (2009). Soviet Cannon - A Comprehensive Study of Soviet Arms and Ammunition in Calibres 12.7mm to 57mm. Austria: Koll. p. 91. ISBN 978-3-200-01445-9. Beevor, Antony (1999). Stalingrad. United Kingdom: Penguin. p. 154. ISBN 978-0-14-103240-5. This page was last edited on 30 September 2018, at 18:59 (UTC).